Unwind and relax in warm bath infused with the wonderful aroma of Lavender Essential Oil. D R Harris Lavender Bath Salts fill the bath, and the bathroom, with soothing and relaxing aroma, making your bath-time a truly refining experience. 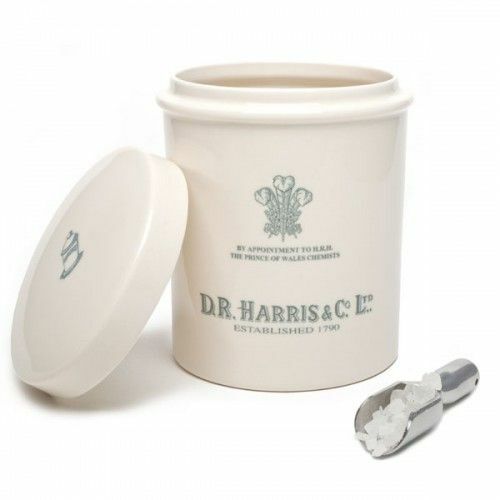 D R Harris Lavender Bath Salts come complete with a stylish silver scoop and ceramic storage jar making them the perfect gift for he who has everything. Take the stress and tension out of your body with D R Harris' soothing Lavender Bath Salts. Poured into running warm water, D R Harris Bath Salts release the aroma of Lavender into the water and the air creating a completely relaxing, heavenly experience. Using the stylish silver scoop provided, sprinkle a scoop-full of Lavender Bath Salts into running warm water. Pour the bath salts into running water to encourage them to release their scent and dissolve more quickly. Whenever you need a relaxing soak.